This summer my kids brought home a stray kitten. They begged me to keep it. I actually considered keeping it, but it hated the dog. I thought maybe they could learn to get along, but while bathing the kitten I discovered it had fleas. The more I washed it, the more fleas I found. After some consideration, I decided that the cat had to go. If it had gotten along with the dog, I might have dealt with the fleas, but I was worried about an infestation and I couldn’t handle the idea of the dog and cat chasing each other around the house nonstop. You’re probably wondering, “What does any of this have to do with dog biscuits?” Well, after I realized how completely infested the cat was with fleas, I started to worry about whether there were fleas on my dog or in my house even though the cat had only been inside for about five minutes aside from its bath. I started researching natural flea repellents and remedies online. My friend Alicia gave me some essential oils to spray on the carpet and furniture to deter fleas and I found some recipes for various dog washes, sprays and supplements to prevent (but probably not kill) fleas. While I was searching, I came across various recipes for dog biscuits. Some were designed to deter fleas while others were just tasty treats for your best friend. I was going to bake up a batch of the flea-repellent biscuits for Luther, but after a few days I decided he didn’t actually have fleas so it never happened. I’ve been making a Christmas gifts and a while ago I decided that biscuits would be a great thing to give to all my friends with dogs. So, I walked down to the D.O.G. 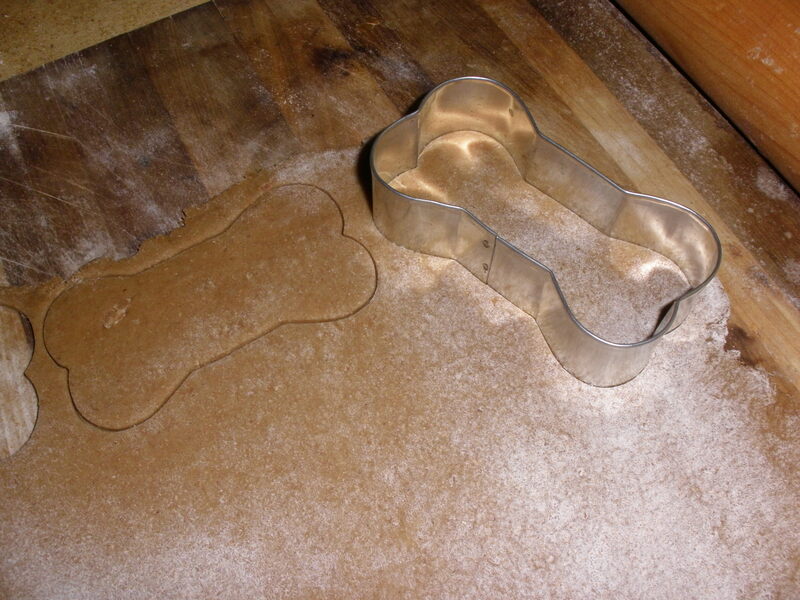 bakery and bought a dog-bone shaped cookie cutter and whipped up a batch of Luther-approved dog bones to give to friends. Here is the recipe I developed based on several different recipes I found online. The garlic and brewer’s yeast make the biscuits flea repellent and the bacon makes them tasty. 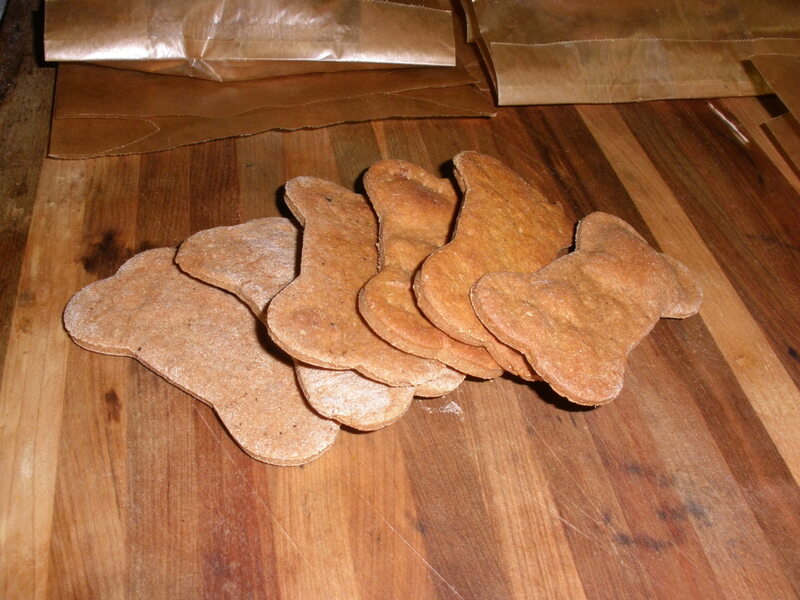 The ingredients you need to make tasty dog treats. The finished dough, kneaded and ready to roll out. Combine bacon grease and garlic powder in mixer bowl. In a separate bowl or 4-cup measuring cup, combine flour, wheat germ, brewer’s yeast and salt. In a small bowl, whisk together the egg and the stock or whey. 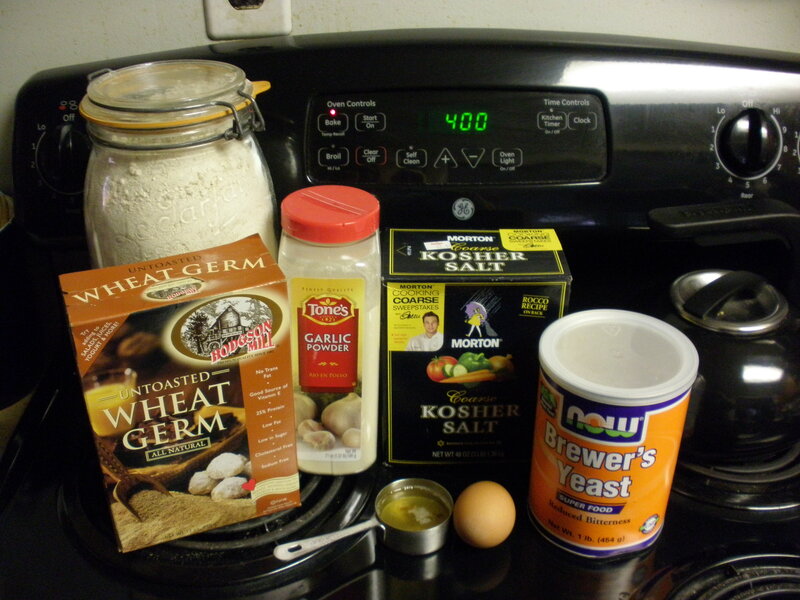 To the grease, alternately add dry and wet ingredients and mix well. Knead by hand or with dough hook for two minutes. The finished dough rolled and ready to cut into biscuits. 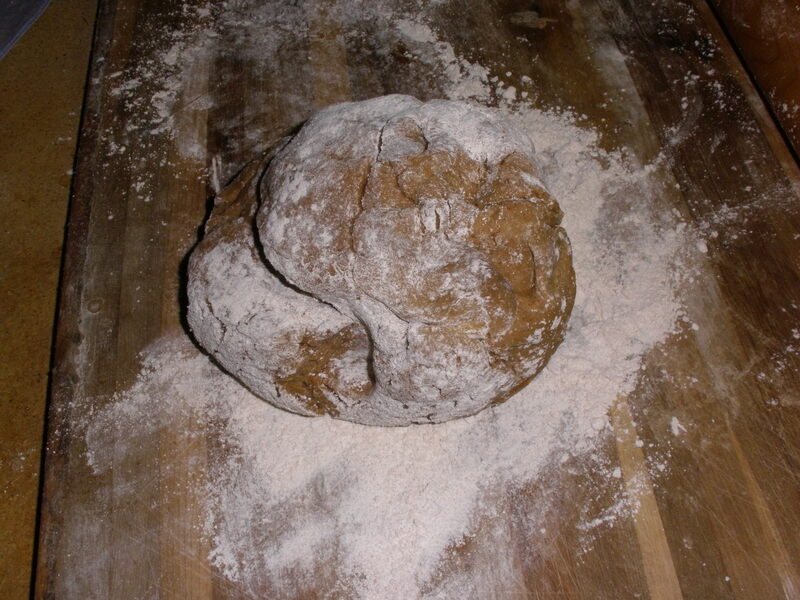 On a lightly floured surface, roll the dough out about 1/4″ thick. Use a fork to poke lots of little holes in the rolled dough. This prevents air bubbles from forming in the treats. Cut into rectangles with a knife or use a cookie cutter to make bone or other-shaped treats. Place treats on an ungreased cookie sheet and bake ten minutes. Remove from the oven, flip the treats over, and return to the oven for 4-6 more minutes until the biscuits are golden. A half-dozen of the finished treats. Treats will be crispy but sturdy when cooled. This made about four dozen treats using my bone-shaped cutter, but could make lots more if you used a smaller cutter or a knife to make bite-sized treats. I used waxed-paper baggies to package the treats in six-packs. Thanks for all the posts! I love your site, so much useful information. On that note, I considered it important to note that, according to many sources, including my dog’s vet, garlic is toxic to dogs. Large dosages and regular exposure can cause gastrointestinal irritation and could lead to red blood cell damage. I’d hate for you or anyone to inadvertently harm their pet. Thanks for the recipe! These will make fun gifts for my friends and my dogs Buddy will be happy to taste test, I’m sure!